The highly anticipated, extremely diverse sophomore effort fuses the sounds of Merle Haggard, Hank Sr, and Waylon Jennings with Social Distortion, ZZ Top, and Bad Religion by combining bold lyrics with country & western melodies and brash punk beats. Sleepin' Rattlers sophomore release, Punktry & Western Music, Vol II, builds on the foundation of their debut album and delivers a clear audible definition of the genre they've coined "Punktry & Western Music". From the attitude and energy in the straight punk-rock opening track, "It's Our Job to Keep Punktry Elite", to the traditional country waltz, "Last Punk Rock Song", these boys have a sound of their own and you can hear the blue collar in every track. Written, recorded, produced, and mixed at Sleepin' Rattlers headquarters - The Snake Pit in Dallas, Tx - Punktry & Western Music, Vol II has a DIY feel yet incredible production value. This is music done the old-school way. Waylon, Cash, Hank, the Ramones, and Sid Vicious would all be proud to see music still being made this way. But don't let the DIY approach fool you. The songwriting and production on this album clearly proves a maturation process has occurred since the band formed in 2012. The stand-out song with obvious mainstream appeal is "Everything You're Looking For". Band founder and front-man, Brad Bevill, mixes thoughtful lyrics on love with an intoxicating melody that will be stuck in your head for days. If you are already a Rattlers fan and enjoyed the debut release, the new album is a must-have. With the band solidified and three years under their belts, the sound is polished and all theirs. You will not be disappointed. 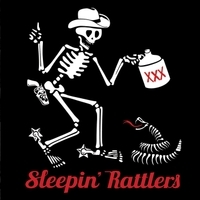 If you're a fan of outlaw country, punk rock, Texas, whiskey, women, and beer, you've found your "happy place" in the new Sleepin' Rattlers album, "Punktry & Western Music, Vol II". And something tells me this is not even close to the last you'll hear of these boys.